Shore Durometer is a scale used industry-wide to measure the hardness of rubber and plastic materials. When selecting rubber sheet, there are various thicknesses and lengths, but also varying hardnesses. Hardness is an important consideration in sealing materials. A material that is too soft may break under stress while a very hard material may not compress enough to form a seal. Durometer is measured by use of a durometer gauge, which is pressed into the material to test its compression. 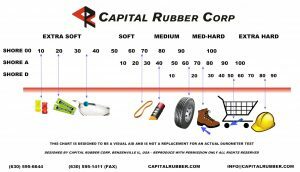 The below chart shows the durometer of many common items, so if a durometer guage is not available please use this as a guide. While other scales exist, there are three commonly used Shore scales in the rubber and plastics industry: Shore A (medium range), Shore D (very hard range), and Shore OO (very soft range).